Please refer to our stock # TE10017 when inquiring. 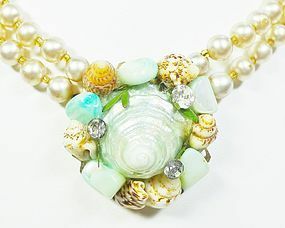 This is a very pretty double strand old cream colored pearl necklace with a stunning shell pendant. The pearls are separated with tiny glass rondels. The necklace is a choker, but there is an issue with the fact that the extender is partially missing, so it is only a 12" necklace. I have two choices for extending it - pearls that won't match in all probability, or a gold colored chain. With either of them I could make it 2-3" longer which is how it probably was originally. I probably will put a chain on it, which will be shinier than the rest of the chain but will be in the back, so it probably won't show. Aother issue is that some of the pearls are not in good condition - some have a tiny pin prick and about 3-4 have significant peeling. So, I have priced the necklace accordingly. It is marked Japan on the hook.